Perdido Sun is your place in the sun. From your own large, beach-front balcony you can enjoy spectacular beach views of the clear emerald waters and dazzling white sand. A kid-friendly complex, Perdido Sun has an awesome indoor pool, outdoor pool and hot tub, grilling area and fitness room. This 7th floor unit has been recently updated including paint, blackout drapes in Living Room, new radiant cooktop stove, wall-mounted TV's, new patio furniture and living room furnishings. Ceramic tile throughout. Electronics include 40” HD TV, DVD, CD Player in Living Room and 32” HD TV, DVD in Bedroom. The owners have also stocked the entertainment console with games, cards, dominos and puzzles for your family enjoyment. My family and I had a great, relaxing time at this property! 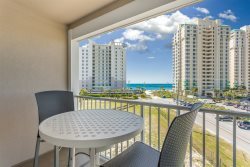 Clean, convenient location, amazing pools, access to the beach, and a gorgeous balcony view! Friendly and easy to work with owners too! Highly recommended!! This was the 4th time that we have rented through Perdido Key Realty. They have always been very honest and forthright about the properties, no misrepresentations of the amenities and features of the properties that we have rented. Check-in and check-out has always been a breeze. I loved this unit!!! Being able to sit out on the balcony and see and hear the gulf was amazing. The unit had everything that you could possibly need (except for a washer and dryer in the unit but we are fall renters and can utilize the laundry downstairs). The furnishings were very nice and we had everything that we needed to enjoy our stay. Loved this unit!! We had everything we needed to enjoy our stay. We really enjoyed our mini vacation! Thanks!